Recently we started homeschooling our 5 year old, which means that our 2 year old also feels like she needs to be home schooled. We always include 2-year-old Maria in our activities but usually she just tags along to whatever subject our son is learning, which is usually over her head. This week, I decided to do an activity geared for our toddler to help her learn her colors. This is a very simple experiment that only uses three ingredients that you most likely have in your house already. And what's best is that even the older siblings will enjoy this project. Pour the milk into a glass casserole style dish. 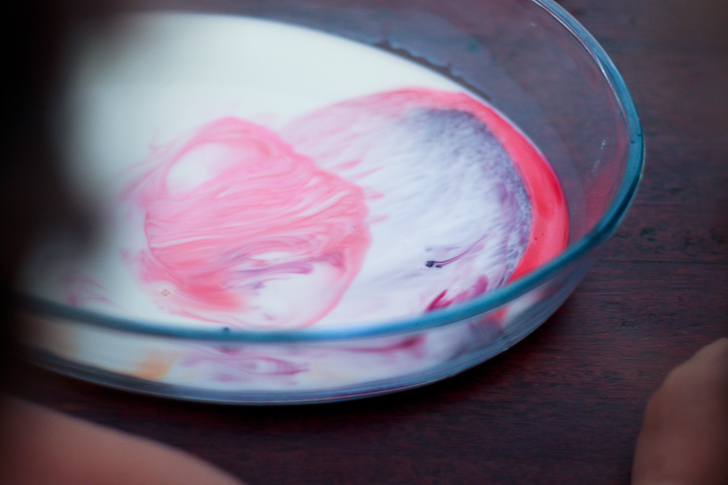 Then add a couple of drops of food coloring to the milk. Talk to your child about the different colors. Have her or him point out the different colors. See if they recognize the colors. 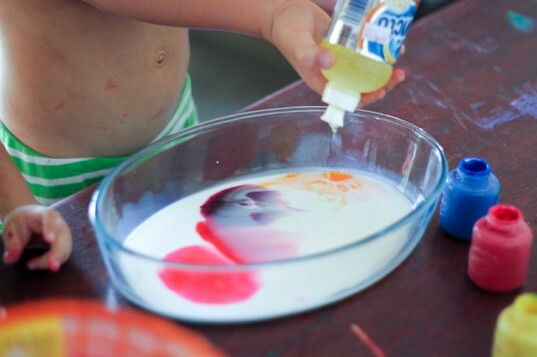 Have your child add a couple of drops of detergent right on top of the food coloring. Right when the soap hits the milk, the colors will start to mix and transform into new colors. It’s very cool to watch. At this point you can explain to them that red and blue make purple, yellow and blue make green, and so on. The best way to learn is to play. Sometimes following steps can be hard for a 2 year old. In this experiment she had to follow a couple of steps, now let her touch and play with the milk. 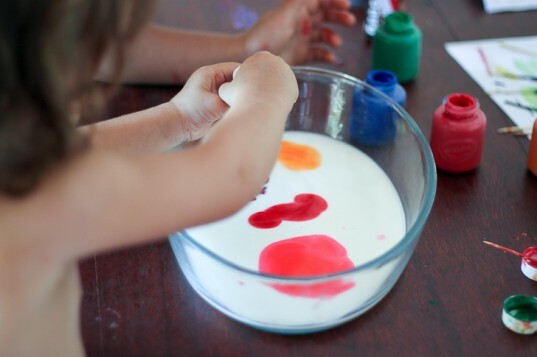 With her little fingers she can mix the milk, draw cool designs, and watch the colors become a rainbow. Our 2 year old loved this experiment as did our 5 year old, and because it was so easy to do, we’ve done it over again with new colors. 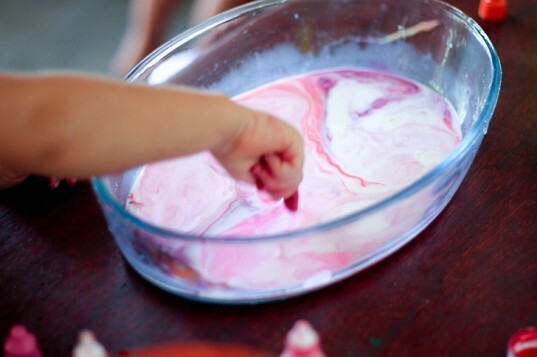 Have your child add a couple of drops of detergent right on top of the food coloring. 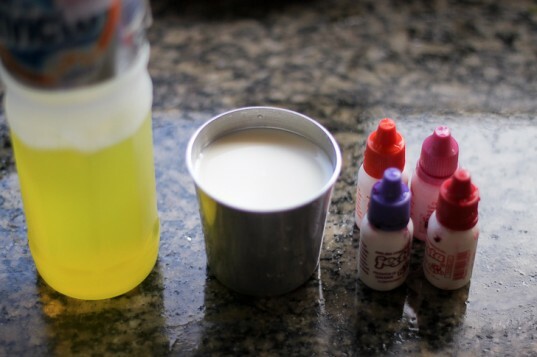 Right when the soap hits the milk, the colors will start to mix and transform into new colors. It's very cool to watch. At this point you can explain to them that red and blue make purple, yellow and blue make green, and so on. Our 2 year old loved this experiment as did our 5 year old, and because it was so easy to do, we've done it over again with new colors.